Yup, it's that time of year! The flip flops and shorts are long gone. The life jackets and kayak have been properly stored for the winter, and the ol' bike has been relocated up into the rafters of the shed - far out of the way of the snow blower, shovels, sleds, and of course that obnoxious 50 lb bucket of ice melt. Part of me is sad to see this transition... but once I focus in on my ski gear, sitting there ready for me to grab it at a moments notice, my outlook on life perks back up. Now all we need to do is wait for mother nature to deliver the goods! As an outdoor enthusiast, I understand the draw that winter on the slopes and trails can have. After all, there's nothing quite like a day with your friends and family taking in the gorgeous mountain vistas, breathing in the crisp alpine air and carving tracks into some of the best natural powder on the east coast. So as we wait for those days to arrive (hopefully, sooner rather than later) let's run through the top 5 ski events to mark on your calendar. Let's start with the annual season kickoff - The Snowball Gala at Big Tupper Ski Area. In the Adirondacks, this has in many ways become the highlight of the holiday season! The lodge at Big Tupper transforms into a winter wonderland of holiday decor, a festive atmosphere, live music, and plenty of great drinks to go around. For me this is a time when I can step away from the shopping, wrapping, and other chores that accompany the holiday season and celebrate what I am most looking forward to... hitting the slopes with my family (and maybe even trying out some new ski gear that Santa might be leaving under the tree). But what makes this event special is that knowing every dollar raised will go to support the volunteer operations of Big Tupper this winter. So we invite you to trade in your ski boots for dancing shoes and come enjoy a night of fun at Big Tupper. This year's Snowball is schedule for Saturday, December 12. Cross-country ski centers around the Adirondacks are known to have full moon ski parties, and Tupper Lake is no exception (skip to number 4 for details). But here we also like to hit the trails on the dark nights as well. Why you ask? Well, to ski (or snowshoe) with the stars of course! On the darkest winter nights (a/k/a new moon) you can experience a unique event as the Adirondack Public Observatory teams up with the trail crew at the Tupper Lake Groom Cross-Country Ski Center for a night of stargazing on the trails. 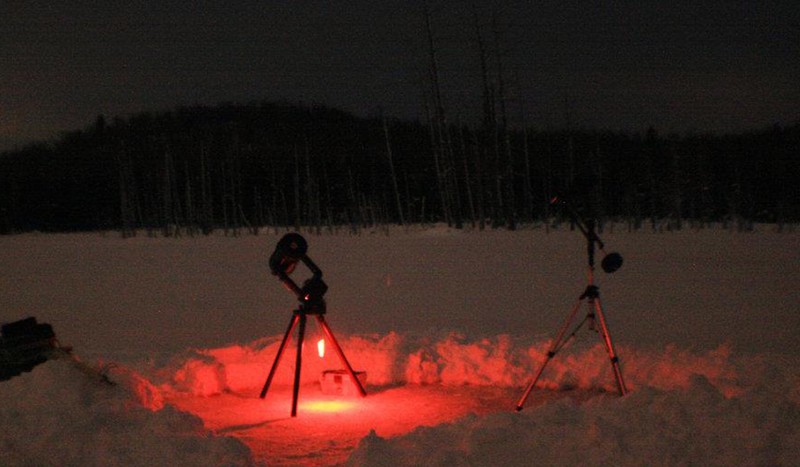 Grab your skis and shoes and follow the trails to Cranberry Pond where telescopes will be set up for free stargazing. Better yet, members of the Adirondack Public Observatory will be there to help you get a grasp for exactly what you are looking at. This season the Skiing with the Stars events are scheduled for January 9 and February 6. In 2015, Tupper Lake saw a brand new winter festival come to life it featured everything from fireworks, winter golf and dog sled rides, to live music on the slopes of Big Tupper. With a successful inaugural year, the two-day Fire & Ice Festival has quickly become a crowning point for the winter season. On Sunday, February 21, Fire & Ice festivities will move from the Tupper Lake Municipal Park (where most of the action takes place on Saturday) up to Big Tupper Ski Area, where skiers & riders will be entertained with live music, fun races, children activities, a craft fair and more! Make sure to keep an eye on this one as the event schedule continues to grow. The 2016 Fire & Ice Festival is schedule for February 20-21.
Who doesn't love an evening ski or snowshoe as the glow of the moon reflects off of the white surface of the snow? When the full moon hits, that's when cross-country skiers and snowshoers follow the moonlit trails of the Tupper Lake Groomed Cross-Country Ski Center. Don't miss this laid back full moon party at Cranberry Pond. Pack up some trail snacks, your favorite beverages, and a headlamp, then gather with good company around the bonfire for what just might be the ideal setting to enjoy an authentic Adirondack evening. This season's Full Moon Skis are scheduled for January 23 & February 20. In addition, there will be a bonus Full Moon Ski schedule on Christmas night. Talk about a good way to escape and unwind after a giant meal (and maybe too much time with Aunt Betty). Now, last but not least, you need to mark your calendars for the Annual Tupper Lake Brew-Ski. This one just might have to be one of my favorite events of the year. Seriously, can it get much better then a mile-long brewfest? Join the fun as the Tupper Lake Chamber of Commerce hosts a variety of local breweries as they set up sampling stations on the golf course loop of the Tupper Lake Groomed Cross-Country Ski Center. For a small fee participants can ski or snowshoe from station to station as they chat with the brewers (and fellow beer lovers), sample the top local brews, and warm up with good company around the fire pits along the way. This year's Tupper Lake Brew-Ski is scheduled for Saturday, March 5. Whether it's alpine or cross-country that calls your name, know that Tupper Lake will have some great conditions and fun events waiting for you in the near future. PS - If you really can't wait to see some powder, then check out the screening of ski film, Fade to Winter, coming up on Saturday, December 2 at the Adirondack State Theater. Proceeds from this fun event go to support 2016 Fire & Ice Festival. This week in related ADK pre-ski season news: Wax On! Trading skates for skis: A first-time skiing adventure at Whiteface. Newbie skier returns: Friends, falls, face-plants - it's all good fun at Titus. It's cool: Snowshoe or cross-country ski at Dewey. CATS on the Coast: Not just for hiking - get your skis out here this season! More Gore: Downhill just keeps getting better. Get your ski on: From head to toe and rentals to repairs! Nordic or Alpine: Lapland or Oak - you decide.